Earlier today, as part of our Four Swords Adventures aniversary celebration, we brought back a classic article that looked into how unifinshed concepts from Four Swords Adventures found their way into the plot of Twilight Princess. But there’s another story that you may not know about the history of Four Swords Adventures. Looking back into the development of the game, there are bits and pieces of evidence that suggest that it was once set to become a very, very important and well-known event in Hylian history before its plot was changed. Here at Zelda Informer we’ve tackled the topic of how chunks of unfiinshed plot from Four Swords Adventures wound up in Twilight Princess, but there’s another story you may not have heard, unless you’re one of the die hard fans that floats around in theorizing forums. Not surprisingly, given the already present parallels between the games, it involves A Link to the Past, and more specificially, it’s backstory. The tale of the “Imprisoning War”, or “Seal War” in the original Japanese, tells the story of the first ever breach of the Sacred Realm. Many people sought the entrance to the Sacred Realm, the resting place of the wish-granting Triforce, but none of them were successful until Ganondorf and his group of thieves discovered the entrance. Claiming the Triforce for his own, he was reborn as Ganon King of Evil, and his dark power spread throughout Hyrule. The King of Hyrule called upon the Knights of Hyrule and the Seven Sages to seal Ganon away, and the Sages began to search for the legendary Master Sword, the Blade of Evil’s Bane, as well as a Hero worthy to wield it. But the situation grew dire, and the Knights of Hyrule perished in their battle with Ganon’s evil forces. 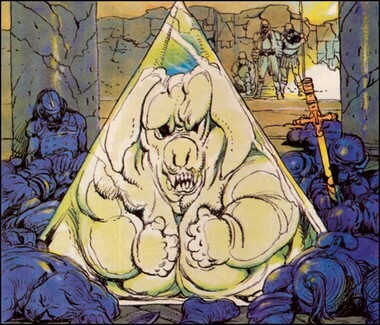 Using themselves as shields, they managed to buy the Sages enough time to seal Ganon away. Artistic depiction of the Seal War. Years later this story would be used as the basis for Ocarina of Time’s plot. Now there are quite a few discrepancies between the two stories, but developers have confirmed that, at the time at least, Ocarina of Time was meant to be the Seal War. The majority of the differences between the stories can just be written off as the details of a legend changing over time, but there is one glaring issue. Ocarina of Time ends with Ganon trapped in the corrupted Sacred Realm and holding one Triforce piece, but A Link to the Past starts with him in the corrupted Sacred Realm possessing all three pieces. Various theories have tried to explain this, but in the end, no one can deny it’s a major issue in connecting the two games, and with the releases of Wind Waker and Twilight Princess, both sequels to Ocarina of Time, and both games in which Ganon dies, the issue becomes further clouded. Let’s not focus on Ocarina of Time so much though. Whether or not it is still the Seal War is a subject for a different time. There’s another Zelda game that features Ganon being sealed away, and that, of course, is Four Swords Adventures. Like A Link to the Past and its backstory, Four Swords Adventures features a Dark World, Seven Maidens, Knights of Hyrule, and a sealing. This alone has caused many people to think that it may have replaced Ocarina of Time as the new Seal War, but it too has its major discrepancies. For starters, the sealing is done by the Seven Maidens, and not the Seven Sages. A Link to the Past notes that the Maidens are descended from the Sages, but the Seal War specifically says that Sages were the casters of the seal. Then there’s the seal itself. Both stories have Ganon being sealed, bu tin Four Swords Adventures the Sacred Realm is never actually mentioned, and we don’t really get any indication that Ganon ever entered it, or acquired the Triforce. The Knights of Hyrule, meanwhile, did not perish in order to buy time for the seal, but instead were cursed by Ganon and turned into monsters. As we previously investigated though, Four Swords Adventures went through some major changes in its development process, and evidence of those changes can still be found today. If you search through a text dump, a complete grouping of all the text stored inside the game, you’ll find quite a handfull of quotes that made it into the game disk, but are not actually found anywhere by playing the game. What this means is these quotes are what’s left over after changes were made late enough in the game’s development that they already had most of the text put together. That’s right. Even though this game is all about the Four Sword, the Master Sword was in the plans for the game late enough into production that text for it still remains in the game disk. Seems strange to include two mystical blades, if not for important plot reasons. Was this planned for Four Swords Adventures? So what’s the significance of this quote? As previously mentioned, both A Link to the Past and Four Swords Adventures have a Dark World in them, and in A Link to the Past, the Dark World is the corrupted Sacred Realm. The absence of any talk of the Sacred Realm in Four Swords Adventures, combined with the fact that its Dark World isn’t even literally dark in an aesthetic sense, unlike that of A Link to the Past, makes it ambiguous as to whether the two Dark Worlds are the same place or not. The most interesting difference here though is that in Four Swords Adventures, the Dark World is exited by stepping through portals called Moon Gates, whereas in A Link to the Past, it can only be exited by the use of the Magic Mirror. If the Magic Mirror was in the plans for Four Swords Adventures, that means that late in development, its Dark World was suppose to function the same as the Dark World of A Link to the Past. Interestingly enough, when Aganhim breaks the seal on the Sacred Realm by capturing the Seven Maidens, a large portal opens up betwen worlds. This could imply that the Magic Mirror is only needed to exit the Dark World if it is sealed, making its intended inclusion in Four Swords Adventures even more relevant to the Seal War. In an effort to preserve our beautiful ancient tongue, I’ve made a language exam. Four Swords Adventures was originally intended to have a mini-game in which Link takes an exam on the ancient Hylian language. This exam comes into play because the language is on the verge of extinction, apparently being replaced by a new tongue. In A Link to the Past, there are inscriptions written in the ancient Hylian language, and none of them can be read without the Book of Mudora, showing that the extinction of the language has become complete. Once again we see just how closely the games were meant to connect originally. The ancient Hylian tongue, extinct by A Link to the Past. 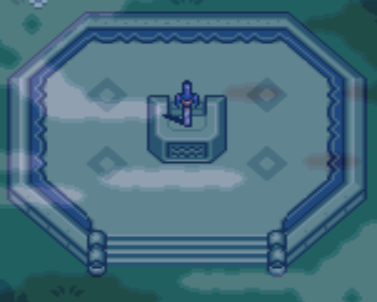 In conclusion, while the two games remain similar, Four Swords Adventures had the chance to have a much stronger connection to the classic A Link to the Past than what it did. It even came close to replacing Ocarina of Time in its spot in Hylian history as arguably the most important event to transpire in the world of Zelda. Still, in its final form, it’s a become a memorable adventure all of its own.